Michael Cutlip makes artwork that adds a new and innovative voice to the art world chorus. Vestigial notes of Cubism, Surrealism, Pop Art, Street Art, and Neo-Expressionism play underneath the purity of his joyful and media-rich sound. Cutlip is a Cubist at heart with a simultaneous vision that invites investigation and inspires experimentation. He erases the lines between painting, drawing and collage, and he does not look up to see if anyone notices that he has no idea where he will place his next mark or with what he will make that mark. As he works, he decides which materials are available and appropriate. He does not feel obligated to stick to a singular subject within the same artwork. Instead, layer upon layer, he recounts multiple narratives through the ancient form of stacked perspective. As a twenty-first century Surrealist of sorts, Cutlip plays a solo version of the Exquisite Corpse game, thus keeping his process immediate and unknown, even to himself, during the progression of creating. Sometimes a pool of paint suggests an image; other times he scrapes away paint to enhance surface beauty. Apparently random and appropriated animal imagery appears on a slightly abstracted, highly patterned field of color. Kitchen-wall yellow, tomato red, bathroom-tile pink, and the turquoise blue of old radios and ranges evoke the seemingly innocent 1950s in the not-so-naïve 2012 and trigger memories that, for many young viewers, especially the artist, are completely new and conceptually imagined. Using the visual language of his time, Cutlip pushes, re-presents and builds on the planned spontaneity and serendipity practiced by Jean-Michel Basquiat and Robert Rauschenberg. Like that of the Neo-Expressionist/Punk Scene artist Basquiat, his art appears to be “unstudied” because he brings together so many different traditions to one stage. From Rauschenberg, Cutlip learned to “trust the process.” He says, “The process is essential. I work in the moment. In my experiences, a planned painting is a failed painting.” He continues to explore, experiment and mine the pictorial possibilities of color, form and the mundane, everyday symbols and objects of life within an urban/consumerist landscape and lexicon. Collaged elements give the artist’s paintings a three-dimensional tactile tangibility. The nearly imperceptible shadows created by the space between support and paper impart a sense of mystery and invite the viewer to an extended process of looking, which in turn, makes for a more amplified encounter. Cutlip has an extraordinary ability to manifest the discarded or discounted image, thought or feeling into an act of transformation. He teases the surface into a jazzy slow-dance song with a contemporary rap beat as he subtracts form here and adds structure there. He has a free-flowing, almost-but-not-quite random, way of working; he draws, brushes, sprays, glues, etches, and appropriates images with the imagination and fearlessness of a five year old. By recycling images that sometimes seem out of context, he leaves interpretation to the viewer. If all art is autobiographical, then we all, artist and audience, bring something to a painting by imposing our own lives into its narrative. Cutlip’s work encourages these chance associations and transformations and therefore connects with the viewer on an authentic, deeply communicative level. For Cutlip, the “…painting must be free to wander. The best works are those that seem to simply happen.” When I find myself falling into an artwork at first sight, I wait to see if it is infatuation or love. If the melody arising from the work floats into my mind unbidden over the next couple of weeks, I know that my initial reaction is aesthetically sound and rooted in experience and expertise rather than in a moment of whimsical flirtation. 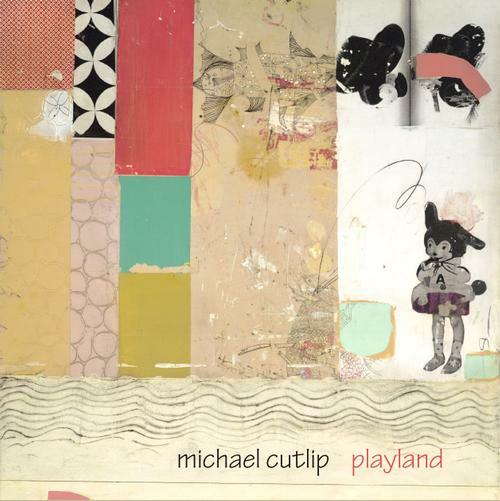 Michael Cutlip’s work has progressed and deepened by practice, time and attention. It is delightful to see a continuum of wonder-filled freshness that is resolutely and unabashedly child-like and man-sure.